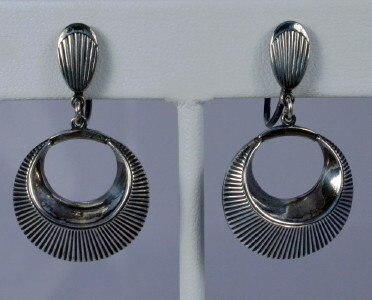 1950's vintage mid century era earrings. Swedish 830 silver. Stylized dimensional drop hoop with chased ridges and plain inner ring. Oval ridged button front screw back. Marked 830 (3 crown) on screw back edge. All original mid century era, true 1950's vintage. Excellent condition. Slight discolor at rhinestones.